The NFPA Certified Life Safety Specialist (CLSS-HC) for Health Care Facility Managers program was created in 2015 after extensive market research was conducted with facility managers within the health care industry. The research indicated a strong desire among health care facility managers to have a credential that highlights their knowledge of the many life safety challenges within a health care environment and how to keep their facilities in compliance with the 2012 edition of NFPA 101®, Life Safety Code. Note: To all Centers for Medicare and Medicaid Services (CMS) surveyor candidates: CMS requires Life Safety Code Surveyor candidates pass the NFPA Certified Fire Inspector – I (CFI-I) exam not the CLSS-HC exam. Edward Browne, Vice President of Support Services for the Cambridge Health Alliance, talks about the creation and importance of this certification. The exam is based on the 2012 edition of NFPA 101®, Life Safety Code®. It is the candidate’s responsibility to obtain this reference source for study purposes and to have present during the examination. It is the only reference source allowed in the examination room. If you would like to purchase this NFPA document, please go to NFPA's online catalog. 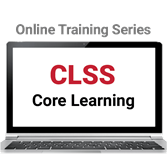 Save on facility managers' must-have NFPA code training for health care with the CLSS Core Learning Online Training Series.